The worst maritime disaster in recorded human history occurred in the closing days of World War II and is little known in popular history. The torpedoing of the M/V Wilhelm Gustloff claimed ~9,000 lives including as many as 4,000 children. By comparison the RMS Titanic disaster cost 1,517 lives. In the waning days of World War II, the once vaunted German Wehrmacht was pressed into ever shrinking pockets of territory by advancing Soviet armies. Admiral Karl Donitz, desperate to evacuate 2 million German personnel and civilians from isolated pockets of German territory on the Baltic Coast, initiated Operation Hannibal – an evacuation almost six times the size of Dunkirk. 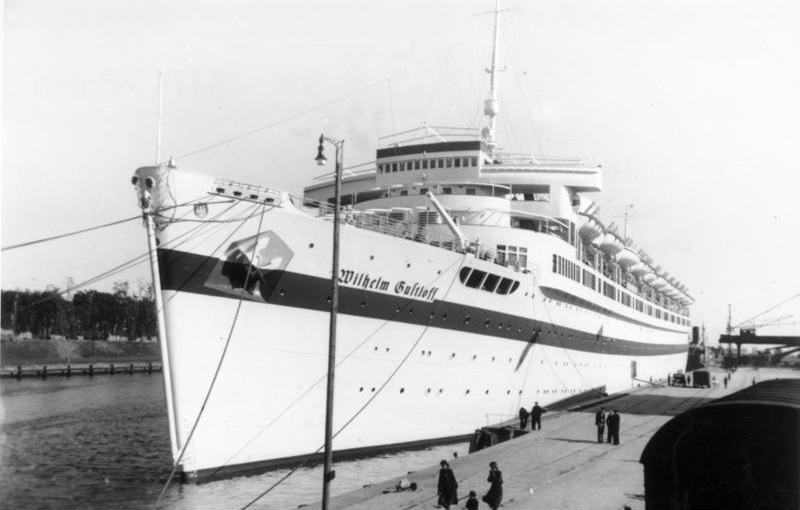 Among the ships used in the evacuation was the Wilhelm Gustloff, a former luxury liner built in 1938 to provide holiday excursions as part of Hitler’s “Strength Through Joy” program. Confiscated by the Kriegsmarine at the outbreak of hostilities in September, 1939, the ship served as a hospital ship and floating barracks. The Wilhelm Gustloff departed Gotenhafen on January 30, 1945 with more than 10,000 refugees and military personnel. Less than 9 hours after leaving Gotenhafen, the ship was spotted by the Soviet submarine S-13 which loosed a four torpedo salvo. Three of the four torpedoes (the fourth jammed in the tube) found their mark and within 70 minutes the Wilhelm Gustloff lay 150 feet beneath the Baltic Sea. More than 9,000 souls perished in the sinking, but for propaganda reasons the Nazi regime kept news of the sinking from spreading within the crumbling Third Reich. For numerous reasons, most importantly the overshadowing of the tragedy by the ending of the war and the exposure of Nazi death camps, the disaster is not a pop culture icon like the sinking of the RMS Titanic or the RMS Lusitania. Some historians have speculated that the looted Amber Room might have been aboard and the Soviets allegedly launched an expedition to the wreck site during the Cold War. Evidence pointing to the Amber Room being aboard is circumstantial at best. The last known sighting of the room was in nearby Konigsberg Castle just days before the ship sailed. The room had been packaged into 27 crates and eyewitnesses report the moving of similar sized crates from trucks to the ship prior to its departure. In the most thorough analysis of the fate of the Amber Room to date , authors Catherine Scott-Clark and Adrian Levy posit that the Amber Room was destroyed on land sometime during the frantic evacuations from East Prussia and has been forever lost.